However, don’t let the term “target group” frighten you. Being a member of a target group means a person is experiencing something in their life that warrants a little extra help getting a job. These are neighbors and co-workers, maybe even you or me right now. Read more about WOTC target groups here. Back to timing. 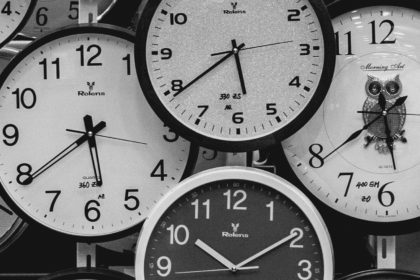 Timing can make or break the WOTC certification process. “Certification? What is that?” you ask. Let’s assume for this discussion that you are an employer. To claim a tax benefit under the WOTC program, you must first request a certification from the WOTC office at your state’s workforce agency. The certification verifies that your new employee is WOTC eligible. After (and only after) that certification is approved, your company can claim an amazingly valuable tax credit! There are multiple steps to this process. Let’s walk through it and see why timing is critical. Your job applicant or new hire completes IRS Form 8850, also known as the WOTC Pre-screening Notice. 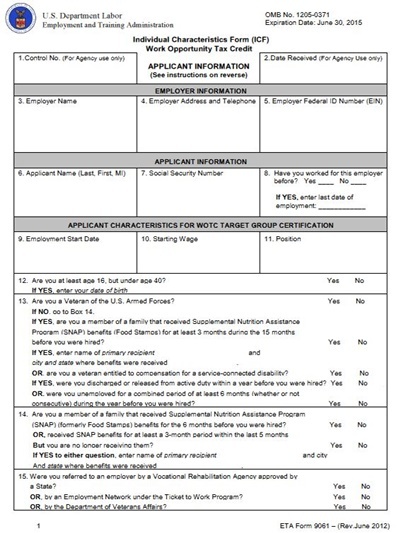 The questions on this form help to determine if an individual has experienced any of the WOTC-qualifying circumstances. By law, this form must be completed “on or before the day” you offer them a job. Many companies conduct this screening on the same day employees fill out their other new-hire paperwork. It cannot be completed later. Using the Department of Labor’s ETA 9061 WOTC Individual Characteristics form, your new hire now responds to a second set of questions. These questions are more detailed than those on the WOTC Pre-screening Notice I mentioned above. Less like the IRS 8850, this form requests specific and detailed information about topics that are illegal to ask about prior to hire. Additional caution is needed to avoid actual or perceived violations of employment law. Also, while employees themselves must use and sign the Pre-screening Notice, you can use other instruments to request this more detailed secondary information. This approach can be helpful because many employees find the Individual Characteristics form complicated and difficult to read. For example, you (or a helpful WOTC analyst from WOTC Planet) could ask these questions verbally, or in a private survey, or using an online questionnaire. You could then transfer the employee’s information onto the Individual Characteristics form and sign it yourself. Having collected the necessary information and forms, you now submit both forms as an application to the state workforce agency. The completed IRS 8850 Pre-screening Notice MUST be submitted within 28 days of the eligible employee’s start date. Notice an important distinction. For this 28-day deadline, I referred to the employee’s start date – not their “offer date” or “hire date.” The 28-day calendar clock starts ticking on the employee’s start date. Of course, it’s possible that the offer, hire and start date could all be the same day. But not necessarily. The WOTC program distinguishes between each of these events and dates. There are a variety of ways to submit WOTC applications to your state workforce agency. Most states publish instructions on their website. All will accept applications by mail (postmarked by the 28th day). Most can also accept applications by fax or through an manual-entry form on their website. A growing number of state’s can even accept hundreds of applications at once, uploaded within a spreadsheet. Your state workforce agency will review your application and issue a certification if your new hire meets the criteria for WOTC eligibility. In most states, this takes anywhere from a few weeks to a few months or more. After your WOTC application has been submitted (within 28 days of your employee’s start date), you can safely turn your attention to documentation. The state workforce agency requires proof that your employee is actually qualified. This could include proof of age, date of birth, residency address, military service, disability, receipt of public assistance, date of felony conviction (or date released from incarceration) and others. Have a close look at the instructions section of Form ETA 9061. These instructions include a detailed list of acceptable documents. Some of these documents are available from an employee’s work file. For example, an employee’s W-4 can be submitted as proof of an employee’s residency address at time of hire. Others are more difficult to acquire like proof of military service, felony-conviction or incarceration-release dates. And sometimes, legally sensitive inquires and documents are involved — for example, age, disability or personal and family economic status (i.e., food stamps and other forms of public assistance). What about appeals? How and when you submit proof documents presents a special concern. In many state, the state workforce agency cannot accept proof documents until after they request it. Other states won’t request documents — they instead DENY your application for lack of documentation! This denial becomes your invitation to appeal by sending the proof documents with an appeal letter. Duane can’t help himself when it comes to reporting the news about WOTC and other tax credits. It’s so much fun! He’s also WOTC Planet’s newest Partner and Director of Business Development.